around 1681 and the territory given name Town of Stow on May 16, 1683.
only 28 families, and no resident Minister until 1689. Last week's column left off with Stow having gained land from Sudbury and given up land to Harvard and Shirley. 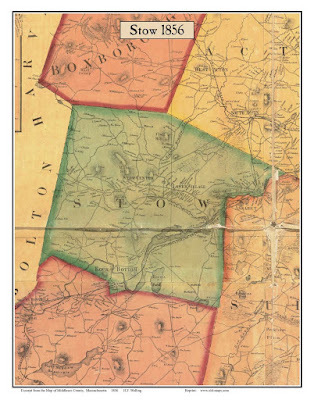 After the Shirley subtraction, Stow was contained within seemingly sensible boundaries (no more Stow Leg), but would subsequently lose land and people to Boxborough, Hudson and Maynard. Boxborough was created as a District in 1783, officially becoming a Town in 1835. Its creation took parts of Stow, Harvard and Littleton. Stow amiably gave up hundreds of acres, but Boxborough's situation with Littleton was contentious. The compromise was that individual landowners within the District of Boxborough could consider themselves residents of Littleton and pay taxes accordingly. Over subsequent decades most of these landowners or their descendents finally agreed to become Boxborough-ites, but two farm-owning families were still holdouts until 1890. Finally, a piece of the border between the towns was shifted south, making them legally part of Littleton. Earlier, in 1868, there had been an attempt to expand Boxborough by acquiring West Acton. This failed. Back in 1702 Stow had tried for a much larger land acquisition. In the aftermath of King Philip's war, the Indian town of Nashobah, some sixteen square miles, had been vacated. Individuals were moving in, and towns such as Groton were shifting borders. Stow reasoned that the land was adjacent to its northern border, and would be a gain toward raising taxes to support a Minister. Stow lost. Nashobah was later incorporated as Littleton. In another border brouhaha, there was a thwarted early attempt to chop off a southern portion of Stow via a petition to create a new town from land in Sudbury, Framingham, Marlborough and Stow in 1739. This was opposed by parent towns in 1740. Nothing came of it. known as Rock Bottom. Click on images to enlarge. Hudson nibbled on parts of Stow in 1866. The creation of this manufacturing town came mostly from Marlborough, but included about 350 acres from Stow's southwest corner. The small loss of land to Hudson did not raise opposition from Stow. Two asides: a downward dip in the middle of Hudson's northern border dates to 1783, and was designed to leave mills and associated buildings (now the hamlet of Gleasondale) in Stow rather than partially in Marlborough, and two years after Hudson was created it bought two square miles from Bolton for $10,000. From a collection of stories about Stow's history, collected by Lewis Halprin, there was one final minor boundary adjustment with Hudson in 1979: putting a dividing line down the center of the three upper basins of Lake Boon. Prior to that there had been a straight line border which had caused a dozen or so houses on the north side of the lake, surrounded by Stow, to be legally part of Hudson and a similar number of houses on the south side, reachable only via Hudson, legally part of Stow. The creation of Maynard on April 19, 1871 took 1,300 acres from Stow, but of greater impact, nearly half its population, in what was informally had been called Assabet Village. There were some exploratory town-founding rumblings in 1870, followed by a petition to the Commonwealth of Massachusetts, filed January 26, 1871. Supportive petitions with additional signers were submitted in January and February. All told, nearly 160 signatures gathered. Key points of the complaint were that the fast-growing population clustered around the woolen mill on the Assabet River was miles away from the town centers of Sudbury and Stow, and were not getting adequate school and street improvement spending despite taxes being paid to the parent towns. There was opposition to the petition. Stow residents countered with three remonstrances, stating that such a division would remove “…the only portion that has increased in its population and in its valuation for the past ten years.” A total of 136 men signed three counter-proposals. Stow lost. In compensation Stow received $6,500 plus interest ($1,470) spread out over seven years. The only solace was that an initial, non-official proposal for a 'Greater Maynard' would have taken close to an additional 600 acres from the southeast edge of Stow, all the way down to White Pond. What was left to Stow after Maynard decamped was an area of 18.1 square miles (11,584 acres) with a population of about 1,000. With the exception of the Gleasondale mills, Stow remained primarily a farm town (poultry and apples) for a long time, not reaching a population of greater than 2,000 until the 1950s. Much of the work on this topic, including the "Stow Leg" map, rests on research that Francis W. Warren, a Stow historian, conducted in 1979 for a lecture "Boundaries of Stow," some since revisited and retold by Stow historian and author, Lewis Halprin. Concluded in Part Three.